The main and auxiliary screw barrels of the styrofoam compactor are made of high-strength and high-quality carbon structural steel. They are durable and adopt a conical screw barrel to speed up the feeding speed and greatly improve the output and quality. The styrofoam compactor is produced by the main and auxiliary machines, and the heating temperature is stable, which effectively improves the molecular structure of the material, enhances the gas permeability, and significantly improves the quality of the particles. The foam granulating unit is mainly composed of a broken dry cleaning machine, an extruder and an automatic traction granulator. Automatic feeding, automatic temperature control, automatic dust removal, impurity removal, automatic filter screen and other integrated design, no pollution during production. 1. 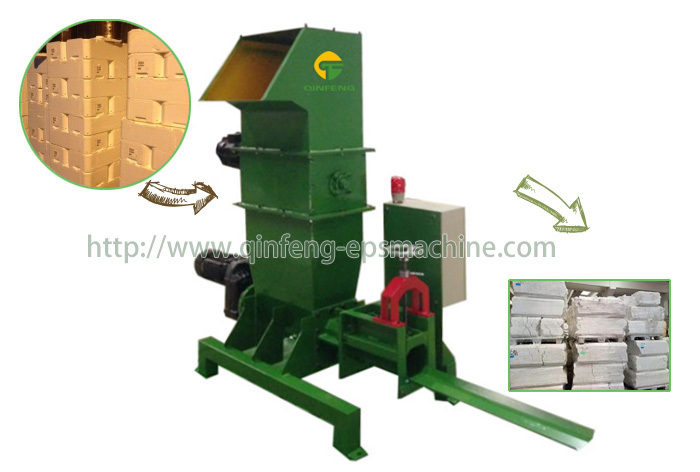 The new generation styrofoam compactor adopts new technology, new design, beautiful appearance and convenient use. 2. The styrofoam compactor has complete supporting facilities and can be continuously and continuously produced. It is automated from raw material crushing, drawing and cutting into pellets. 3. The complete styrofoam compactor has a small footprint, low power consumption, high quality finished products and wide application range. 4. Make full use of the high-pressure friction heating system, automatic heating production, avoiding the heating system continuous heating, more energy saving. 5. Both the screw and the discharge port are made of imported high-strength carbon structure lead steel, which is durable and not easy to deform. 1. The styrofoam compactor mainly produces thermoplastics such as PS and PE. The complete set of complete sets includes: crushing washing machine, granulator, pelletizer, hopper, cooling water tank, motor pulley, motor frame. , stove (heating coil), etc. 2. The set of complete sets of equipment can be automatically and continuously produced. Due to the improvement of machine manufacturing strength, the equipment can be continuously produced in 24 hours. In addition, the special exhaust and drainage device of the equipment, so the waste does not need to be dried after washing, can be directly granulated, (dry material can also be produced) and the granulation is clean, no pollution and aging, greatly reducing production costs and improving production. effectiveness. 3. The styrofoam compactor has the remarkable features of small volume, high efficiency, good performance, low power consumption, high quality of finished products and wide adaptability, and will not affect the output. It can also be equipped with automatic screen changer head, electric (or manual) screen change without stopping the machine; in addition, relevant auxiliary equipment can be configured as needed: sharpener, scraper and so on. In the plastic granulating unit, the main machine double mixing and plasticizing and mixing is uniform, the structure is compact, the auxiliary machine adopts the wind to send aggregate, the vibration is separated and cooled, and has the advantages of high automation and high production efficiency. The unit has a wind-feeding aggregate system made of stainless steel. Corrosion resistant, wear resistant, beautiful and durable.